Several stories from The Spur have been translated and published — five appeared on Jadaliyya, trans. Marilyn Hacker — but this story, trans. Robert J. Farley, was published in 1985, a year when presidential elections were held in Syria and there was only one candidate, Hafez al-Assad. He won a reported 100% of the vote. The Lion contemplated all that was around him: the clear blue sky, the golden sunshine, the green grass and flowers of yellow, red, and white. He then became distressed, and his resentment towards death, the Owl, and aging tormented him. But he forgot his sorrows immediately when he caught a glance of a plump fox, and he readied himself to chase after it. Curiosity overcame the Lion. “What are you saying?” he asked the Fox. “Yesterday, one of the oracles told me that you will die after the passing of one day from my death,” the Fox replied. “And what was I thinking about?” inquired the perplexed Lion. The Fox was delighted and indicated his agreement with the Lion. Of the formerly unpleasant situation, a love was born which now granted him a happy life, free from peril and pain. The Lion then realized what had happened, and he felt the deepest regret. He was convinced that he would die the next day just as the Fox had said. But he did not die. He continued to live, hunting the foxes and all of the other creatures weaker than him. Originally published on June 29, 1985 as “Li-Kul Thʿalab Nihāyya” in Majalla al-Taḍāmun (“Solidarity Magazine”). 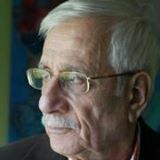 Zakariya Tamer was born in 1931 in the Al-Basha district of Damascus. His works have been translated into many languages, including English: Tigers on the Tenth Day (trans. Denys Johnson-Davies) and Breaking Knees (trans. Ibrahim Muhawi). Robert J. Farley is a doctoral student of comparative literature at UCLA, focusing on Arabic literature and gender studies. He is currently based in Amman, Jordan as a Foreign Language and Area Studies Fellow for the 2013-14 academic year.